Retired. I was an innkeeper. And in fact it was your inn where Jesus was born. That’s right. Well, not in the inn itself. Out back. Yeah. I still get a lot of flak for that. I mean that people still criticize me for not having room at the inn. They say to me, you couldn’t give a pregnant woman a room? You couldn’t give a room to the woman pregnant with the divine child? Couldn’t even spare a broom closet for the Baby Jesus? I say, well, look. First off, it wasn’t just me. If you go back you’ll see that every inn was full. Census, schmensus. It was the foot races. Bethlehem versus Cana. Also there was a touring theater troupe from Greece. Only appearance in Judea. The city was packed. We had reservations for months. I had three pregnant ladies at the inn that night. One was giving birth when Joe and Mary showed up. She was down the hall, screaming at the top of her lungs, cursing like you wouldn’t believe. Her husband tried to encourage her to push and she kicked him in the groin. Think about that. She’s crowning a baby, and she takes the time to put her foot into her husband’s testicles. So maybe you’ll understand why even if I had a room, I wouldn’t be in a rush to give it up to those two. But you ended up letting them go out to the animal shed. Joe comes in and asks for a room, and I tell him we’re all out of rooms and have been for months. Foot races. Theater groupies. And such. And he says, come on, please. I’ve got a pregnant lady with me. And I say, you hear that down the hall? I’m full up with pregnant ladies. And he says, this baby is important. And I say, hey, buddy, I don’t care if he’s the Son of God, I don’t have any rooms. So there’s some irony there. I guess so. And then he says, look, we’ll take anything. And so I say, as a joke, all right, you can go and sleep with animals if you like. And he says fine and slaps some money on the counter. Yeah. And I say, I was kidding about that. And he says, and my wife’s water just broke in your lobby. What could I do? I pointed him in the direction of the animals. It’s better than having the baby in the street. I suppose so, but you know, if the reason they were in Bethlehem was because of the census, then he had family in the area, right? It’s his ancestral home and all that. He can’t say to a cousin, hey, give us a couch? There are some family dynamics going on there that have been conveniently left unexamined, if you ask me. Joseph had a lot on his mind. “Oh, interesting” is right. Let me ask you. So your baby is born, and the first thing you do is put him in an open container filled with grain and covered in oxen drool? Does this seem reasonable to you? You did have them out with the animals. Their options were limited. I rented cribs. I asked Joseph, do you want a crib. And he said, no, we’re fine, and then sets the kid in the food box. And I say to him, you’re new at this, aren’t you. In his defense, he was. And then someone says, look, the animals, they are adoring the baby. And I say, adoring, hell. They’re wondering why there’s a baby in their food. On the other hand, the image of the Baby Jesus in the manger is a classic one. Yeah, I mention that when people get on my case about not giving Joe and Mary a room. I tell them that having a Christmas carol called “Away in a Hotel Room” doesn’t have quite the same ring to it. They never have anything to say to that. It’s said that a star appeared on the night when Jesus was born. Did you see it? No. I was too busy trying to convince Joseph to rent a crib. It’s said it was bright enough to lead the Three Wise Men to your inn. Well, three men showed up at the inn. I don’t know how wise they were. The baby is born, right? And then these guys show up. And they say, we have brought gifts for the child. And I say, that’s nice, what did you bring. And they say, we have brought gold and frankincense and myrrh. And I say, you’ve got to be kidding. Let me quote another Christmas song for you. “A child, a child, shivers in the cold, let us bring him silver and gold.” Really? Silver and gold? And not, oh, I don’t know, a blanket? An newborn infant is exhibiting signs of possible hypothermia and your response is to give him cold metal objects? Who ever wrote that song needs a smack upside the head. You’re saying the gifts were inappropriate. What’s wrong with diapers? A nice jumper or two? A Baby Bjorn? They were riding around on a donkey, you know. A Baby Bjorn would have come in handy. Have you ever in your life gone to a baby shower where someone says, congratulations on the baby, here’s some perfume. No. Because most people have some sense. I think the idea is that all the gifts were fit for a king. Yes, a king who first pooped in my animals’ manger. I would have appreciated a gift of diapers. And another thing, they brought all these expensive gifts, but do you ever hear about Joe and Mary and Jesus being anything but poor? Or at the very most working class? Exactly. I think what happened is these three guys show up and they say, here are all these expensive gifts we got your baby. Oh and by the way, we happen to know King Herod thinks your baby’s a threat and plans to kill every kid younger than two years of age just to be sure, so you better go. Egypt’s nice this time of year. What? You’re traveling by donkey? Well, then you can’t take all these nice gifts with you. We’ll just hold on to them for now, write us a letter when you get settled and we’ll mail them. And then they never do. I don’t think there’s scriptural support for that theory. I’m not saying I have any evidence. All I’m saying is that it makes sense. After the Three Wise Men, were there other visitors? Yeah. It got a little crowded. The animal sheds aren’t designed for a large amount of foot traffic. And then that kid showed up with a drum, and I said, all right, fine, we’re done. The song of that incident suggests the drum went over well. After the birth, did your inn benefit from the notoriety? Not really. Jesus kind of slipped off everyone’s radar, for, what? Thirty years? Thirty-five? Right. So there wasn’t much benefit there. I got some mileage out of telling the story about the crazy couple who rented my animal shed, and the visitors, and the drumming, but I mostly told it to friends. Then just as I’m about to retire someone tells me of this hippie preacher in Jerusalem who got in trouble with the Romans. And I say, hey, I think I know that guy. I think he got born in my shed. And then, well. You know what the Romans did to him. Romans, feh. Then I sold the inn to my nephew and retired to Joppa. By the time Jesus became really famous I was out of the game. And then my nephew sold the inn and they put that church there. It’s nice. I liked the inn better, of course. I would have comped Joseph the crib. That still would have changed the Christmas carol. I know. But, look. You didn’t have to wash out that manger. I was holding it together until that line. Nice one, John. Thanks, John! Hope your holidays are wonderful! This is the funniest thing anyone will ever write in the history of the world. Okay, maybe not, but damn…. Almost spewed Diet Pepsi. Nice! If you consider requests, I’d like an interview with Joseph next year. It isn’t easy being an inn keeper. Poor dude. Scalzi, you have outdone yourself. No, I didn’t say undone yourself. You modesty is intact. But this is well done. My co-workers think I’m having a seizure. Virgin birth, or a woman that had a story and was determined to stick to it? Yeah, the manger line was where I lost it too. You know the thing about those so-called “wise” men? They were bugging the hell out of every new parent in the inn, even gave the gifts to another couple with a kid before grabbing them back and heading for the animal shed. I wonder whatever happened to that kid? Looking forward to the Easter complaint about the Romans whipping this guy through the streets and tying up traffic. I’m guessing that in a couple hundred years or so, this’ll make it into some religion’s bible. If you published this in a newsletter I would subscribe to it. This is freaking brilliant – and to that end I was wondering if it would be OK with you John if I, ahem, adapted this slightly for a church service I’m leading on Christmas eve… probably not the audience you were intending, but I think it is a really great piece. LOL. I think you’d do well in this part, sans glasses. Ho ho ho! None of this would have happed if Joseph had a Visa card. Because in Bethlehem they don’t know how to treat a lady, and they don’t take Aramaic Express. 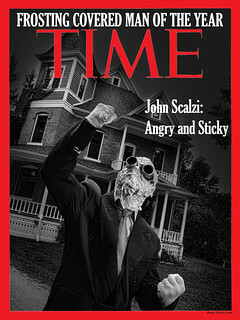 John Scalzi I just totally Love You!!!! Red wine. Snorted through both nostrils. Inability to breathe. Other assorted symptoms of mirth and hilarity. One of the best early Christmas presents I’ve had for years. Thanks John. Don’t you dare stop. You may, but don’t blame me if people DON’T THINK IT’S FUNNY. Well, I thought it was hilarious. May I have permission to do a reading with a partner to a small group, not to be recorded? If it’s a private, non-commercial sort of thing, sure. An newborn infant is exhibiting signs of possible hypothermia and your response is to give him cold metal objects? Who ever wrote that song needs a smack upside the head. Goldurnit, you scotched my sinuses! Me: Brane, we will *not* go there. John, thank you (ow) for the (oww) wonderful Christmas gift! It’s in the Apocrypha. Really, really apocrypha. Also, “Away in a trough ….” doesn’t sound so pretty either. Great story… probably about as accurate as the rest of the myth…. One observation concerning the top picture: there are definitely 2 babies shown here… did Mary have twins? It seems Joesph is paying attention to one while Mary is holding the other… maybe paternal twins? Could the whole virgin thing be some kinda hoax? I wonder what ever became of the “other” Jesus? The other thing that’s always bugged me was how this affected the calender companies… I mean, they only had a week to get out the New Year One calenders! Maybe in the next installment, you could have a conversation between Adam and Eve about their dilemma of having no belly buttons…. The second baby is Miss Mandy Cohen’s son Brian. They were also staying at the inn after Miss Cohen fled from that well known Roman sexual offender Naughtius Maximus. #36, Have you met my fwend Biggus Dickus? He’s one of the highest-wanking men in Wome. Frank@35: I think Joseph is the guy with the halo sulking in the corner. He’s probably miffed because the livestock get to see the baby but he doesn’t. I don’t know who the women and baby in the foreground are. I get a kick out of that angel hitting up the shepherds for an offering. A Joseph Interview would be good, but I think you should round it out with an interview with Mary. Because she had to be SUPER cranky about the Stable, Manger, Animals, and Idiots with inappropriate gifts. Scalzi, you are one strange guy. Keep up the good work. The second baby could be Thomas. The apostle (?) Thomas was called Didymus, and Thomas is ‘twin’ in Aramaic and Didymos is Greek for twin. Which suggests to many people that Jesus had a twin. It might also explain why Thomas was so sceptical about Jesus’ claims to divinity (“hey I came out of the womb first, how come he gets to be divine and I don’t?”) but then he had obviously never read the story of Castor and Pollux, one of whom was divine and the other not, if I recall correctly. Anyway, I love these kind of commentary stories about great myths – they always give a different perspective. I think this would go down really well at a Unitarian Christmas service, where T S Eliot’s thing about the Wise Men (“A cold coming we had of it…”) is often read, along with poems by U A Fanthorpe, and other such gems. Why isn’t this showing up on the main page anymore? At least the tea I’ve sprayed on my screen is useful for cleaning it a bit! Brilliant. Just what I needed today! Very cool. 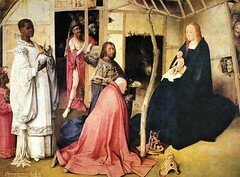 And all the talk about interviewing Joseph, it just brings to mind one of those triptych annunciation paintings from the Renaissance with the angel and Mary and off in a corner, there’s Joseph sitting at his wood working table, but not really doing anything, just staring down at his tools. He’s there, sorta’ as an afterthought. I mean, sure, he can go and create things with his hands but what’s happening one panel over has just blown him away. Sara@40: Great, now I’m picturing Mary kvetching in Fran Drescher’s voice. Sean Eric Fagan is right — this entry is not visible on the home page. Did the innkeeper send it out back? Follow-up: this article believes itself to be archived. Maybe a problem with the posting? Twitter, my holiday gift to you: An interview with the Nativity Innkeeper. Thanks John for the laugh. I see it on my front page. But it’s a little glitch I’ve noticed on WordPress recently. I started being lost at “The city was packed. We had reservations for months” as a — perfectly reasonable — reason for not having a room. Clearly I’ve spent far, far too many years working with front desk staff for conventions . . .
About those gifts, you did note their worth. Joseph could get a fair amount of currency for them, and use them to pay for their stay in Egypt. Until Herod the Great up and dies that is. Are you writing stand up for anyone? If not, will you please start? oh man that’s great… just sent the link out to all my Christmas-hating friends…. That was brilliant. Thank you for the multiple giggles. (and 2 guffaws). For those speculating about the second infant, remember that Jesus had four brothers (James, Joseph, Judas and Simon) and an unspecified number of sisters (Mark 6:3, Matthew 13:55-56). Or four half-brothers and a number of half-sisters I suppose. I’m a little sad I’ve had to bring out the Mallet of Loving Correction on this thread. But it’s out, and clearly I’ll be using it if I decide it’s needed. You offend someone and you are surprised? Really? If you want to delete a post which puts you in the same class as Tom Stoppard, who am I to gainsay you? Er … is there any chance I could hire that mallet of yours for Christmas Dinner? It’d shorten the Annual Argument somewhat. Tom Stoppard has way more hair and ungodly eyebrows! I’m not in the least surprised when I offend people. I also know when a comment placed in my comment thread will not lead anywhere productive. If you had merely said “I was offended by this piece,” your comment would still be up. But you didn’t, and it’s not. That said, I don’t really want to have this particular discussion here anymore; it’s meta to the thread. I do agree, however, about the part regarding Tom Stoppard’s hair. Thanks, John. Partner is thinking about it, which I suspect will mean “no, we shouldn’t”. An interview with the shepherds, as long as people are making suggestions. “Abiding with their flocks.”? JS – ok, I hear you so let me try it this way. I find this equally offensive and no different than those who mock alternate lifestyle preferences. Boy! It looks like I just missed the forum drama fun. I laughed out loud at the story. The interviewer wasn’t opinionated enough for today’s journalism. None of the questions were on the “War on Christmas ©”. This is the version I would read to my children. If I had children. This is the funniest thing I’ve read in many a long day. Thanks, John, for the Christmas cheer. It’s really wonderful. Outside of summer sleeping in the stable is probably the best place if you don’t have problems with the smell. Very warm, very likely warmer than sleeping rooms in an inn at the time (which most likely weren’t heated and had of course no insulated glass windows, only straw and wood to make them somewhat less droughty). My father grew up on a farm and as children they occasionally slept in the stables if the weather was really, really cold. Added benefit according to him: You didn’t need to go out into the cold to the outhouse if the need arises. This is one of those things that gets printed out and put in my “funny folder” and read at holiday family gatherings. Because we’re all a bunch of humorous heathens. Thanks! Great after-work read, John. Thanks! There ain’t much Christmas spirit in South Korea. I mean, they have no Christmas history, no Rockefeeler 50s. They try to understand it, put up trees and decorations and whatever, but it’s like trying to sweep the tide back with a broom. Confucian culture being the tide. Ah well, at least I can be in my parent’s living room via Skype. Merry Christmas, Skype! That was fantastic. Thank you John. I might just translate it, just so I can read it to my children tonight. The wise men did not turn up at the inn! Rookie error! I find this equally offensive and no different than those who mock alternate lifestyle preferences. Wait, you’re saying the oxen were furries? Boy, that puts a new spin on things. I suspect that the other baby might be Little John the Baptist. (Slightly at odds with the biblical account, but there you go.) He’s being held by his father Zachariah, who’s normally depicted as an old man, and attended by his mother Elizabeth. Joseph’s the guy in the bottom left corner looking fed up. Thank you thank you thank you for the BEST Christmas story ever! I will be posting this link on FB (as I do many of yours!) Hilarious! And all of those people who are offended should have stopped reading or were you standing with a gun pointed to their heads? I just do not understand…. It’s good. Many would say, it’s very good. Some might even go so far as to remark that it’s very, very good. But the question you have to ask yourself is, “Is it as good as Interview With a Stick of Butter“? Why yes. Yes, I believe it is. It appears the innkeeper disagrees with you. And who are you going to believe? He was there, after all! I think I speak for (almost) all of us when I say: More inane interviews, please! Cute story. Funniest thing I have read or live changing? Uh, no. Offensive? I don’t see how. Now I have to read the stick of butter thing. This was brilliant, thank you John! being very familiar with the story and hearing it every year now that we are in the holiday season, I had always had it painted as this nice comfortable setting. This article has caused me to look at it differently since I grew up on a farm and now think back to what many of those things were like. WOW this was thought provoking! *snort* *snicker* spew tea over desk. I step away to do some actual work and come back to this very funny thing. Somehow I don’t think this will be appreciated at the my very Irish Catholic In-Law’s dinner table Christmas Eve. But I’m going to read it anyway. I read this to my daughter last night. She laughed and loved it. ‘Course, she also likes Monty Python, Red Dwarf and Black Adder; obviously touched in head. I’ve been meaning to make a nativity scene for a few years now (raku glazed figures). Am thinking I’m now going to include an innkeeper pointing a perfectly good crib while Joseph waves him off. Right up there with ‘A Christmas Story’! An interview with Joseph? I ‘triple-dog dare’ you!! Thank you for this. So funny! “I: Were you really born in a stable? JC: Nahhh. I was born in a hospital. Bethlehem Jewish Hospital, but the hospital was located in a stable. That’s how the story got started. Forwarded to everyone I know, for brilliance. Thanks, John. The “Holy Spirit” had to pay child support till the kid was eighteen…or is it till twenty one in the holy land? Reminds me of The Worst Christmas Pageant Ever….but as a more adult version. There are going to be problems with the reading. Six times through, I keep breaking up. She’s breaking up doing the interviewer, which doesn’t help! Just a warning for others who might try it. I have mixed feelings when Google Reader’s “Recommendations” feature leads me to something I’m tempted to add to my feeds. I also have mixed feelings when I laugh so hard I have to change clothes. Bob Newhart or Robin Williams would deliver this from evil. You know that when a lawyer busts out laughing and coffee-rinses his monitor, it makes the legal secretaries nervous; you know that, right? That went better than rehearsed. You may gain a few new readers. I love how your writing feels in my mouth as I read it aloud, not a clumsy or tricky phrase to be said. Thank you, and may you and yours have a merry and blessed Christmas. Yes! This! *SO* this! That stupid song makes me wince every time that verse is sung — which is a damn shame because I actually like the music. Forgive me for what I’m about to say because most of my living cells really enjoyed this comedy skit but then there are some of my dead cells who keep thinking that some human cells are really enjoying making fun of Our Lord and Savior who truly came to save humanity and for no other reason but they really couldn’t care let. 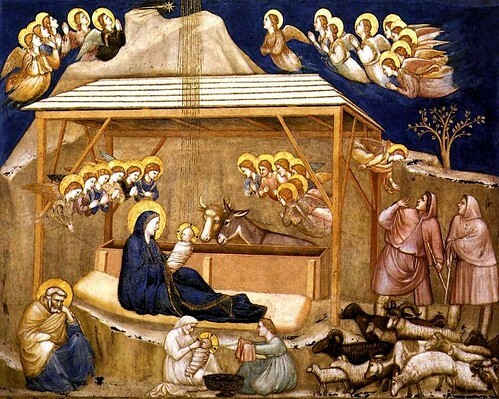 On the second infant: It’s traditional in iconography of the nativity to show “multiple scenes” of the nativity simultaneously. So Jesus is both being held by Mary and being bathed in the same picture. This came to me, from a friend, and I am appalled. You are not… in the least bit funny! Disgusting is more like it. Now, go ahead and delete it, as I am sure you will. Lady, if this rates as “appalling” to you, you need to get out a whole lot more. THAT image. WE could learn a lot from that example and our own imperfect humanity! Maybe Christians need to put HUMOR back into Faith. Thanks for a a good chuckle on a cold dreary day! Oh, come on, people; I’ve heard snarkier things at Midnight Mass. Humor is one of God’s gifts to humankind – just look at all the funny things He invented! The duck-billed platypus, lemmings, penises; I could go on for days. I’ve thought of John S. as the rightful heir to Robert Heinlein ever since I picked up “Old Man’s War”; never thought he’d be in the running to replace Mel Brooks. Maria: Sorry to hear you found this exerpt appalling. But I understand, for sometimes the truth shall make you flee. Not that this interview is the truth in the sense that it actually happened, but more to the fact that I always, ALWAYS – since I was 4yrs old and asked what a manger was, thought a food trough was a crazy place to put a baby. Seriously… who would do that??? Brilliant! I always thought those were the dumbest baby gifts in creation, but I never thought about how they seemed to be lacking in silver and gold afterward *or* the probable infant reaction to a drum. Sorry to hear such a story which has so many errors. The wise men came several years later, that is why the kings came to a house and why king Herod killed all the baby boys up to 2 years old and under. Isn’t it strange that anyone can make fun of the Christmas story yet no one makes fun of the Chinese New Year or any other religion. Also the story is badly misquoted. If you don’t want to believe it leave it alone. I enjoyed it too. I always did think the innkeeper was unfairly condemned. It wasn’t his fault Mary and Joseph came late. It’s not like the Wise Men could stop in at the local Walmart, pick up some diapers and ask the sales clerk for more suggestions. Thanks again, happy holidays, and happy new year. Mary – it’s a riff on the traditions of the oft-told Christmas story in the gospel of Luke, not a historical essay. And people make fun of every religion, and culture, and most other human activities. Not all fun-making is mean-spirited, though; sometimes it’s an affectionate jab at our own silliness. Take the entire corpus of Jewish humour as an example. Or is that not religious enough for you? I didn’t mention it when this was first written, but I did a creative piece that got published in a magazine when I was in undergrad at Marquette, and it was along the very same lines: it was an interview with Satan, with Satan explaining everything from his perspective. And I used basically the exact same tone you’re using here. Kinda eerie. I guess it just goes to show that sometimes two people do come up with pretty much the exact idea independently from each other. 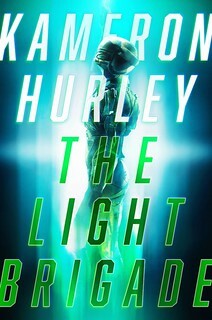 Can’t wait until someone buys the movie rights. BTW for those wondering who the second infant in the picture could be: That’s Bob. Jesus’ brother. sorry. I didn’t mean to imbed the whole thing. just a link. Old people and computers often don’t mix . . . The innkeeper is lying about the manger, though. The kid was wrapped in swaddling clothes. The swaddle might have gotten soiled, but probably not the manger. Also, the reason the Wise Men from the East brought gold, frankincense, and myrrh is that those are what you use at a funeral. It foreshadows that he’s a King, but also that he’s doomed. I found this on the morning of Christmas 2011. This is not a particularly happy time for my family (won’t go into reasons, suffice it to say they are sufficient) and it was what I needed. Thank you so much for a lighthearted look at the season. I needed it. And the innkeeper decidedly did not tell the interviewer about what happened during the census taking when Joseph met the officious Roman official Ridiklus Gawhelpus.It seemed he persisted that the name of the babe was Jeshua son of Joseph of the line of David and Solomon, but his pretty little wife had other ideas there. She kept persisting that he was the Son of God..Jove-Eh and one knows what to think nudge nudge wink wink but she need not have been so emphatic about it. And here was Ridiklus thinking that this sort of behavior was just limited to Grecian and Olympian godly circles but it seems it had begun spilling over into Jewish godly behaviour too. Hmmm. One lives and learns something new every day. Anyway, John, this was hilarious and one hopes that sensitive sensibilities are not offended by this erudite bit of wit and decide to go after you with pitchforks. :-P.
I said, don’t read this if your ribs hurt, because it will make you laugh. She read it anyhow, and laughed until her ribs hurt. You made a sick lady’s ribs hurt! Are you happy now? Are you happy now?